Did you like the Strawberry Creamsicle recipe I shared? 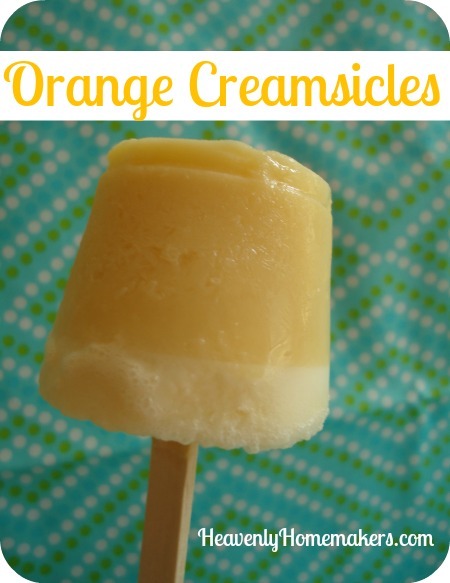 How about an Orange Creamsicle recipe to add some variety? For that matter, you can sub just about any fruit you like to make creamsicles. Such a refreshing treat! It’s worth your small investment to get a box of small 3-ounce cups and a package of popsicle sticks. These truly are so easy to make and everyone at my house loves them! Blend all ingredients in a food processor or blender until smooth and creamy. Pour mixture into popsicle molds or 3-ounce cups. If using 3-ounce cups, place a popsicle stick into the middle of each after these have been in the freezer for about 30 minutes. Freeze for about 2 hours before serving. Makes about 12 small creamsicles. Use a mixture of berries (like raspberries, blueberries, and strawberries) for these. Use different varieties of 100% juice – any of your favorites. Use whipping cream instead of milk to make them even more rich and creamy. Make them in popsicle molds instead of with cups and popsicle sticks. What else can you think of to make these delicious? Could I just use regular orange juice and adjust the quantity somehow? It would be worth a shot, but you may not end up with the same bold flavor. Concentrate isn’t watered down so that flavor is very strong. You would need to use much less orange juice to keep the consistency the same and it would likely result in a less flavorful creamsicle. Hope it turns out well for you either way!